Jasmine Jones is a 22 year old B Corps Fellow at Impact Economy. She encourages businesses to ‘Use business as a force for good’ by measuring their social and environmental impact with as much rigor as their profits. What are the past positions you’ve held that you are most proud of and why? I’ve never really been proud of my past positions. I don’t really count them as real job experiences because I don’t think that they helped to get me where I am or where I would like to be. I am most proud of the work that I’m doing now as a B Corps Fellow. I find it really fulfilling to be doing something that I feel is a creative solution to the inequalities in the world. I feel so blessed and grateful that I found the field in which I want to work. What were some of the most disappointing positions or work that you’ve done? In college I was a Student Assistant for the disability resources office at my college and then served as an intern for the Office for International Students and Scholars. In those positions, I mainly did low-level secretary work-the things that the higher-ups didn’t want to be bothered with like: making copies, drafting emails, filing, and data entry. I was also slightly (very) jealous of my peers who had already figured out what kind of career path they wanted to be on, so I thought it was easier for them to apply to jobs or internships that would give them the experiences they needed for their future careers. I studied International and Area Studies, which is a very broad study program that looked at global disparities in wealth, health, political freedoms, gender and access to basic resources. It would have been cool to work within a non-profit or think tank to figure out creative solutions to approaching these issues, but I still feel a lot of regret when it comes to not using my summers in college to my advantage. I feel that my past life experiences, coursework and extracurricular involvement is what actually got me to the point I’m at today. In my fellowship interview, I drew on my experiences from those areas more so than my actual job experience. I am a poor African-American woman from Ferguson, so I expressed those intersectional issues in my interviews and also how I wanted to use my life and coursework as a lens to approaching my impact economy work. I found that in my coursework that while governments and non-profits are necessary systems to help ease global inequalities, due to a number of complicated factors (e.g. political changes, lack of funding) they are unable to really drive the changes we need for this dying world. Business has been a rich, but largely untapped, resource when it comes to social goodwill. We have been taught that the primary function of business is to maximize shareholder value, and that considering stakeholders (e.g. the environment, the community, and workers) takes focus away from making money. There has been a large culture shift that is putting the spotlight on businesses for them to use their influence and resources to solve the world’s biggest social issues. I just find it very creative and inspiring to find alternative solutions when traditional means have not been getting us where we need to be. What would you say is the most invaluable information or advice you could pass on to those who are looking to break into your field? If you’re currently unemployed or not in your desired job field, how would you help others avoid the situation you’re in? I think it’s really important to take advantage of your university’s career center or departmental resources to find out about opportunities. Don’t be afraid to explore different paths to figure out what you really want to do. Do lots of online research to explore potential opportunities – I found my current position online. Be sure that if you don’t have a related degree in the field, to have other experiences to make up for that content gap. What have you learned from staying in a position that you didn’t like? I learned that I was only making myself miserable by not taking initiative to really pursue my passions, BUT I also learned that it’s not as simple as the movies make it out to be. Not all of us can pull a Julia Roberts “Eat, Pray Love,” and just up and leave our jobs. A lot of circumstances get in the way. For me, those circumstances were mainly economic. So I would use my time off to explore other career options. My college coursework really opened my eyes to a lot of stuff I had never really noticed before. I knew that some people were wealthier than others and that racism exists, but I never really learned about the systems that keep these vicious cycles happening and why traditional solutions aren’t working. My coursework inspired me to get a job without compromising my passion for social justice, and I’m glad that I am at a place where I am more concerned with making an impact than with making lots of money. Actually living life as a minority in terms of class, gender and race has shaped my worldview in many ways. As such, I wanted to find a job where those intersectional issues were all addressed and not thought of as isolated problems. I did a lot of volunteer work with my sorority, Alpha Kappa Alpha. We focused on a lot of issues that specifically affect the black community in the areas of social justice & human rights, health, economics and education. Doing research for programming events added another dimension of my understanding global issues. Seeing the after-effects of the Ferguson tragedy was an impactful resource because I didn’t have to read about the issues in the community – I was faced with it head-on and lived it. I would have used my college summers more wisely to explore potential careers. I let a combination of fear of rejection, laziness, lack of connections and inexperience stop me from really taking job exploration seriously. This is my first job, so I haven’t had to get myself out of a job funk or hole just yet. I really enjoy what I’m doing, but I hope that I don’t become disillusioned too quickly. I tend to be really enamored and obsessed with a social justice issue or solution but then lose faith when I see that it’s not gaining the traction I think it deserves. Changing how for-profit business is normally done will take some time, but for now I think I have enough energy and passion to bring about institutional change in the field. What has been the most impactful experience you’ve had to date & why? How does it relate to what you’re doing now? I think that my study abroad experience in Chile was important. There are lots of racial and economic disparities, especially around quality education in the city of Santiago. One targeted example that I can think of is the mass production of indigenous textiles that are sold cheaply to foreigners at flea markets all over the city. The intellectual property and culture of indigenous groups are profited from, but those groups don’t get the compensation they deserve. Now imagine if a business worked directly with indigenous textile makers in a Fair Trade business owner and properly compensated its workers. Those groups would be lifted economically and they would get the cultural recognition they deserve. However, big businesses like Forever 21 and H&M sell these “Aztec” prints, both generalizing all Latin American indigenous cultures and profiting from this erasure of identity. In the work that I’m doing, we work to encourage businesses to act more responsibly, while considering how doing business impacts other stakeholders. It’s a huge undertaking because current business practices around social responsibility are more done out of legal compliance, than using business for social goodwill. I’ll find something that I’m really obsessed with for short periods of time and then become uninterested or feel like I don’t have the skills or education to pursue that particular field. For now, I am interested in the impact economy. However, I don’t have a business or law background. I think for the job I’m doing now, I’m fine with an International and Area Studies degree, but for me to have the skills to move up within this field, I think an advanced degree would be helpful. I would at least want to get more experience in social enterprise or sustainability (Green stuff). I’ve been considering either a MBA/MSW or law degree to really get some more skills that are applicable in the impact economy. I need to do more research on potential organizations that I could work for with my current degree, so that I can gain more work experience and learn more skills, while not having to pay for an expensive degree so soon. I try to remember that I’m young and that I don’t have to have my entire life figured out. I have lots of room to grow and have to seek out opportunities that encourage growth. I try not to compare myself to my friends or classmates that I think have it all together and just focus on myself or leveraging the network that I do have with having friends all over the place in diverse fields. In what ways do you see yourself investing in your career? Continuing to pursue my passions and not being afraid of ending up in a position I don’t like. Any work experience that I have from now on will be an opportunity for growth and inspiration for me to help shape my career goals. I hate how people are assessed and valued based upon what job they have. It’s like the next question after “What’s your name?” is “What do you do?,” And then based on your answer to that a person either is enthusiastic, or uninterested or secretly judges you while trying to keep a neutral face. It’s like people are so focused on making money that a fellowship like mine will make people feel like I wasted my expensive WashU degree. But I always try to remind myself that purpose is more important than money at this point in my life. That wraps up Jasmine’s interview. Check back in, every Thursday for a new post in the series. 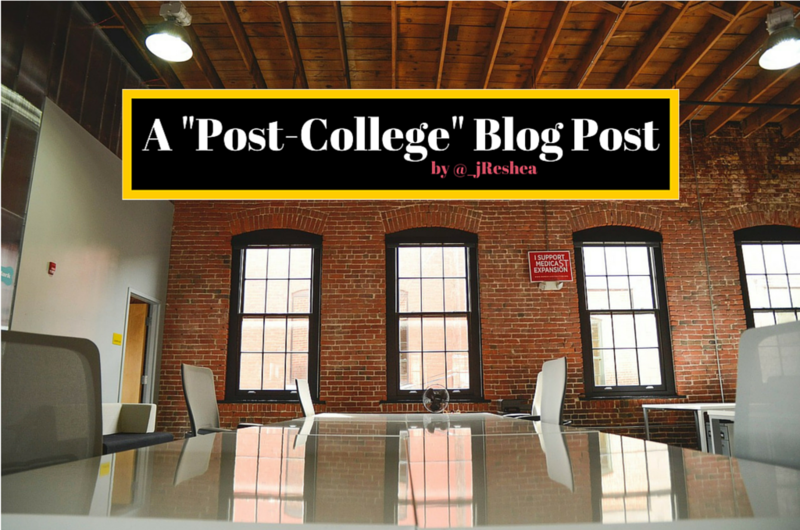 This entry was tagged career advice, career stories, features, Jasmine Jones, Post-College. Bookmark the permalink.